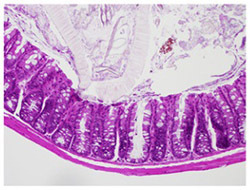 This section of the mouse colon shows increased expression of protein IL-22 and enhanced protection against infection. Northwestern Medicine scientists have found a new molecular mechanism underlying the regulation of the immune system in the gut, which may protect against bacterial infections. In a study recently published in The Journal of Immunology, scientists uncovered a new role for transcription factor Ikaros. Ikaros plays a crucial role in gene expression and moderates the function of T-cells, a type of immune cell. This paper is the first to show the transcription factor regulating T-cells and its creation of protein IL-22 in the gut. 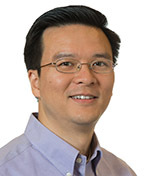 Liang Zhou, MD, PhD, and his team found a new role for transcription factor Ikaros, a protein that plays a crucial role in gene expression, that contributes to the regulation of the immune response in the gut. Zhou hopes this research will contribute to the understanding of how to manipulate the immune response in a patient either to fight an infection or to address autoimmunity. The team used genetic mouse models in addition to immunological assays to find the function of Ikaros. They demonstrated a new role for this transcription factor in inhibiting the IL-22 producing T-cells in in vivo and in vitro experiments. When Ikaros activity was blocked, scientists saw an increase in the production of IL-22, and the mice had a better immune cell response against bacterial infection. Zhou previously discovered other factors that also regulate the creation of IL-22, so he hopes to investigate how these different molecules are communicating with each other to control the production of proteins in the immune response. Next, Zhou’s team wants to learn how this regulation is achieved and ultimately identify a target for new treatments. First author of the study is Jennifer Heller, ’14 PhD. The research was funded by the National Institute of Allergy and Infectious Diseases grants R01 AI089954 and R21 AI091962.